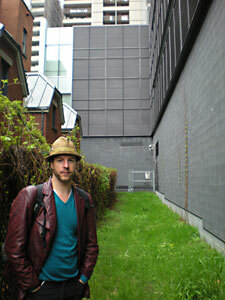 Concordia graduate to build permaculture garden behind John Molson School of Business. On a thin strip of hardy grass behind the towering John Molson School of Business (MB building), Graham Calder hopes to plant Concordia’s next showpiece for sustainability. “Ideally, what we would do to the space is turn it into an auto-fertile, self-irrigating permaculture paradise so that Concordia can show people how easy it is to grow food in this downtown urban environment,” says Calder. Squeezed between the university’s MB building and walk-ups, the small parcel of land is surrounded by a high fence and watched by a security camera. “With our projects we want things to grow every year, so we will be using that land as an experimental space and not doing too much to disturb it,” says Calder, a 2009 Concordia graduate with a BA in Human Environment from the Department of Geography, Planning and Environment. Since then, he’s earned certification in permaculture, a portmanteau of "permanent" and "agriculture", from accredited institutions in Canada and Australia. Calder will not be working the land as part of a Concordia project, but for his own company, P3 Permaculture Design. A social enterprise whose profits are reinvested into community and social organizations, P3 provides students with a 72-hour Permaculture Design Certification Course. “This was the ethic that all cultures around the world used until the advent of oil,” says Calder. “It’s not just gardening, it can be anything. Nature is 4.9 billion years of research that we should be using.” Using permaculture, Calder hopes to teach a system of land-use based on observation and natural principles. “Mostly we will be looking at the underlying soil and I expect that we will build a passive irrigation swale system,” says Calder, describing a system where the land is sloped and undulated to stop water from pooling. With his students expected to start working the land on the west side of the MB building in late May, Calder also explained that he would teach his students how to properly use sheets of soil and compost to grow plants. “This project reinforces the university’s mission of creating learning spaces,” says Concordia Sustainability Coordinator Mariam Masud. Calder credits Masud for convincing the university to allow him to use the space. “This project also exposes students to an alternative system of learning and fulfills Concordia’s goal of creating green spaces on its urban campus,” says Masud. Some Concordia students will be able to enjoy the certification course for a lower price, as P3 subsidizes the classes for low-income earners. For this fall’s session, students will pay a sliding scale of $390 to $585. For those itching to exercise a green thumb on a less formal scale, Sustainable Concordia is seeking members to get involved in its Greenhouse at an open meeting. When: Friday, May 20 from 5 to 8 p.m.